So, I'm not normally a big risk taker when it comes to foundation. I'm not a brand hopper either. For years and years I wore Bare Minerals foundation (the powder). The older I've gotten the more I've realized that my quasi-combination skin is getting drier and drier. The Bare Minerals original powder foundation just was too drying for my skin. First up was Bare Minerals BareSkin Pure Brightening Serum Foundation. This one had RAVE reviews and I was excited to try it. Overall, I was impressed with the coverage but only after I bought the brush that goes with it. That made the difference. I used shade Bare Linen. It was a little confusing that the shades don't correspond to the BareMinerals powder foundation. I usually wear Fair and Fairly Light in the powder foundation so this Bare Linen seemed like a blend of the too. This was a little too warm/yellowy for me. It will be perfect to wear in the summer when I have self tanner on but for winter...it's a little too warm toned. It was also still a little drying for winter. The texture will be nice for warmer weather. Lastly, I would say that it doesn't last a long time without a primer...definitely not as long as the powder foundation. This is the newest liquid from the Bare Minerals group and it's more like a CC cream. It's marketed as a Tinted Hydrating Gel Cream. It's Bare Minerals Complexion Rescue. I used the shade Opal. Overall, I liked the moisturizing qualities of this one. The coverage is not as much as a traditional foundation so this would be really great for running errands or beach/pool side when you want some coverage but not anything heavy. It's supposed to increase the hydration of your skin by 215% after a week of use. I can't say that it did that for me because I didn't wear it for a week consistently. (I wear more coverage for work.) I would really like to try this for an entire week on a vacation or something when I don't HAVE to wear anything heavier. I also wondered if you'd reap benefits from wearing something like this as a primer or under your foundation? Just an idea. I wouldn't venture to consider this a foundation after trying it. It's a tinted moisturizer and is a good fit once you stop considering it a foundation. My overwhelming favorite of the three is a surprising choice. 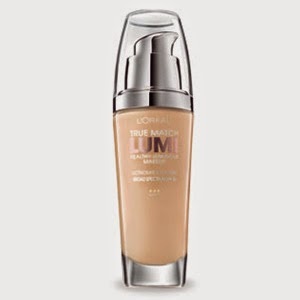 The winner is L'Oreal True Match Lumi Healthy Luminous foundation in the shade Porcelain/Light Ivory. I was very skeptical about this. First of all, I'm a bit of a foundation snob. Secondly, my skin is very sensitive and finicky. It's also a weird shade and it's very dry. I've always figured that drugstore foundation yielded a drug store "result" on my face. I saw someone review this on YouTube so I decided to give it a try. I've worn it for 3 days now and I absolutely love it! It seriously comes through on all the things it claims to do. (Even after 3 days! I can't imagine what it will do after a week!) I was a little bummed by the shade offerings...thinking it wouldn't match well. The shade was actually perfect. I seriously can't get over how much I like this foundation. My skin looks even, dewy and this stuff stays all day long. The best BEST part of this foundation is that it's $20 cheaper than the other two. Seriously, win win! I love when the cheap option wins!